What is the best option when choosing a model of spa table that is very traditional in design? Cabinet base deluxe models in spa tables are very traditional in design, although there is a range of different styles available. These solid looking, detailed pieces are practical yet also very luxurious, giving patients and clients that truly pampered feeling. Some models have internal lights in the cabinets and they can also be equipped with hot towel cabinets, making it easy for the therapist. Cabinet styles of tables may also have built in power outlets, ensuring you never need to search for a plug in for any equipment needed in the procedure. Are there movable tables that are durable and strong and what sizes are they available in? Spa tables are designed and constructed to give maximum strength and durability as well as stability for the patient and therapist. The full cabinet options of tables that are constructed from hardwood are typically designed to be stationary tables, but the scissor base models can be mounted on casters for easy moving. These tables can be wheeled into patient rooms or moved between areas of a therapy or spa facility to be used where and when needed. The castors are designed to lock when the table doesn't have to move, providing an extra level of security. Some of the scissor base tables have adjustable backs that are be manually raised and lowered to position the patient. This is important for multi-function applications where the table may be used for both esthetic procedures as well as for massage. The backrests on these tables can typically be adjusted to a full upright or a completely flat position. Other options include a full flex top that allows the legs to also be positioned. These types of tables do have an electric lift, which allows the therapist to conveniently position the table for easy patient access as well as his or her own comfort. 3. 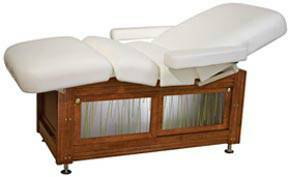 What is the difference between a flat top and a flex top spa table with a full base? A flat top spa table is just what the name implies. The full cabinet base, which can be of several design options, is covered with a simple, flat padded tabletop. The surface is covered with four inches of padding as well as a range of difficult upholstery options. There is also the option to select the color of the wood base, allowing you to create the color combination that best matches your office or spa area décor. 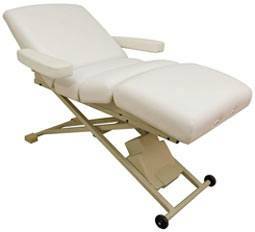 A flex top table can be similar to a flat table when fully extended, but it also provides the option to position the patient or client in a variety of reclining or inclined positions. 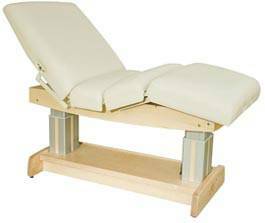 Flex top spa tables have separate positioning for the legs, thighs, buttock area as well as the back and head. The top is typically fully electric and allows easy positioning of the patient with a very easily accessible foot control. These types of spa tables are very practical and provide a full range of treatment options.